activities and some of the best views of the water and the hills. The Horseshoe Bay Country Club and the bay. 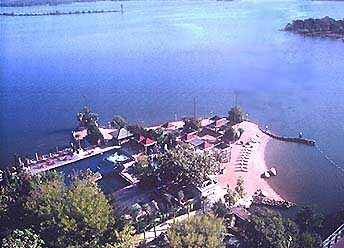 Horseshoe Bay is located on Lake LBJ and has something for everyone in the way of water sports. With three of the best Robert Trent Jones golf courses in the U.S., the country club and pro shops, tennis courts, Yacht Club and one of the largest marinas in Texas, and even riding stables, you will find plenty to do in Horseshoe Bay, Texas. Also available are a putting course, swimming pools, restaurants with lake views and a very relaxing atmosphere. If you are looking for a great place to retire, or looking for a vacation home, this is the place to look. 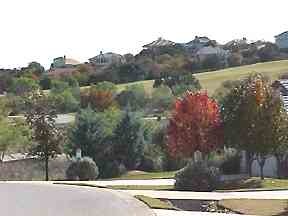 Houses and condominiums are available for sale in Horseshoe Bay priced from $70,000 to well over $1,000,000. The photo above is of the spa at the main swimming pool. The photo above is of a dock in Horseshoe bay. This photo is of "Starbuck", a tame buck, who came around to the homes in Horseshoe Bay begging for a handout of corn. He was a favorite in the neighborhood. This is a rare photo of a Ringtail in a tree at night in Horseshoe Bay. Ringtails are a little larger than squirrels, with tails like a raccoon and a face like a fox. They are nocturnal and are seldom seen. This photo shows a view looking down on Horseshoe Bay and Lake LBJ through the Chapel's windows from the top of the hill. It is an absolutely spectacular view. At the entrance to Horseshoe Bay West you drive through a low water crossing at the creek. This is a typical view of the creek, turtles sunning themselves on the rocks. "If you feed them, they will come." This photo was taken on a patio in Horseshoe Bay of a regular visitor to the home. The next two photos are of the Japanese Water Gardens at the Tennis Club. It is a very peaceful and beautiful place to relax and listen to the waterfalls. A photo of the waterfall at the swimming pool at the Horseshoe Bay West Club. Several photos of Horseshoe Bay and Horseshoe Bay West. Specializing in Lake LBJ Waterfront Properties, and Ranch Properties. Serving all of the Central Texas Area. Marketing Premium Properties - Specializing Personal Quality Client Real Estate Broker Service Since 1968. You, the Client, Always Come First. Boats for sale, boat slips for rent, restaurant, and luxury waterfront cabins for rent. Located just east of Horseshoe Bay, Texas.